A gold-medal performer for serious shooters. Used by Production Division shooters worldwide, including 6-time IPSC World Champion Eric Grauffel. 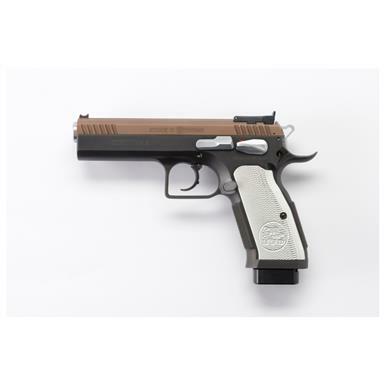 In fact, each EAA Tanfoglio Witness Xtreme Pistol comes with a certificate signed by Mr. Grauffel proof that each one is built to his rigorous standards. The Stock II Xtreme's 2-tone ceramic-coated steel frame provides a rock-solid foundation, while the polygon-rifled coned barrel delivers unparalleled accuracy. It boasts other premium features like Xtreme aluminum grips, a tuned custom shop trigger and much more. Wrap your hands around a Witness Stock II Xtreme Pistol and you'll understand why they've brought home so many trophies from all over the world.